Five amphibian experts are urging the US Fish and Wildlife Service to immediately stop salamander imports. They warn that a recently discovered fungus already devastating salamanders in Europe could imperil American salamanders. Salamanders are an important part of forest ecosystems but also a popular pet worldwide. Nearly three quarters of a million salamanders were imported into the US between 2010 and 2014, 99 percent of them from Asia, where the fungus likely originated. 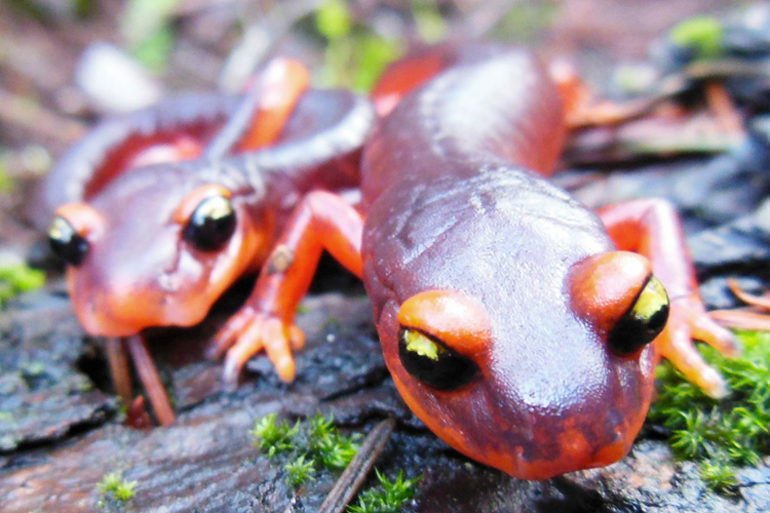 What makes a US ban urgent is that a recent study showed that two common American salamanders—the rough-skinned newt found all over the Pacific Coast and the iconic Eastern newt of the Eastern US—are highly susceptible to the fungus. The fungus, called Batrachochytrium salamandrivorans (Bsal), is related to another fungus—Batrachochytrium dendrobatidis (Bd), or chytrid—that has already severely impacted frog and salamander populations around the globe. “This fungus is much worse than the chytrid fungus, which is more like a lingering disease that affects the skin and puts stress on the salamander until it dies,” says David Wake, a professor in the graduate school at University of California, Berkeley and the director and founder of AmphibiaWeb, an online database of information on amphibian biology. The federal government has been slow to act despite support for the ban by key scientists and an online petition initiated by the Center of Biological Diversity in May. “There is a lot at stake here if the US Fish and Wildlife Service doesn’t stop imports now to prevent the introduction of this devastating pathogen to North America,” says coauthor Michelle Koo, a UC Berkeley researcher in the Museum of Vertebrate Zoology and associate director of AmphibiaWeb, an online database of information on amphibian biology. A paper describing the potential effects of the fungus on US and Mexican salamanders appears today in the journal Science. Koo and first author Tiffany Yap, a UCLA graduate student working in the museum, created a model to identify vulnerable salamander populations in Canada, the US, and Mexico. After pinpointing North American areas similar to the native habitat of the Asian fungus, they assessed the salamander populations in those areas and their proximity to ports of entry for the salamander trade. The model produced a map of salamander populations at highest risk of declines and extinctions from the fungus, with hotspots in the southeastern United States, particularly the southern extent of the Appalachian Mountain range and its southern neighboring region; the Pacific Northwest and the Sierra Nevada; and the central highlands of Mexico. Through AmphibiaWeb, Koo is working with the US Forest Service to create an online portal where biologists can record occurrences of Bsal infection, in order to track the spread of the fungus. Koo will discuss the Bsal vulnerability model and centralized database this week during the meeting of the Society for the Study of Amphibians and Reptiles, held July 30-August 3 at the University of Kansas. Coauthor Vance Vredenburg, who has studied the chytrid or Bd fungus for more than a decade, notes that more than 200 species of amphibians have gone extinct or are near to extinction as a result of infection, making it the most devastating infectious wildlife disease ever recorded. “I have seen the effects of Bd on frogs, to the point where I’ve seen tens of thousands of animals die in the wild in pristine areas, here in California, right in front of my eyes,” says Vredenburg, an associate professor of biology at San Francisco State University. Richard Ambrose of UCLA is also a coauthor of the paper.